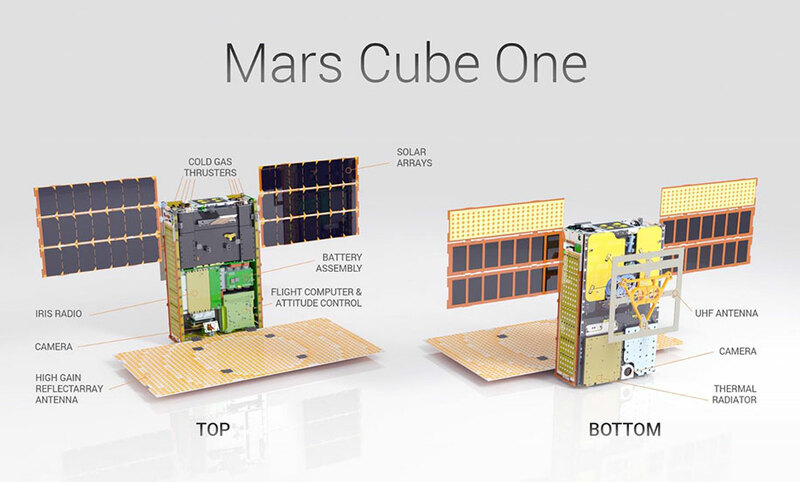 A technology demonstration called Mars Cube One (MarCO) is the first deep space use of the miniature, modular “CubeSat” spacecraft design. The pair of briefcase-sized spacecraft -- MarCO-A and B -- launched on the same rocket as InSight. They have already completed a number of risky deep space navigation and communication experiments. During InSight’s landing, they will attempt to relay the spacecraft’s data as it descends to the Martian surface. The first image captured by one of NASA’s Mars Cube One (MarCO) CubeSats. The image, which shows both the CubeSat’s unfolded high-gain antenna at right and the Earth and its Moon in the center, was taken by MarCO-B on May 9, 2018. 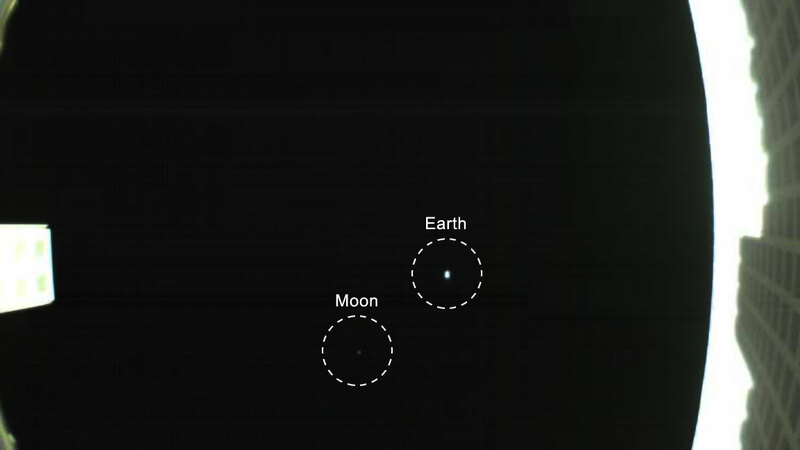 MarCO-A and MarCO-B, also nicknamed EVE and Wall-E, have flown separately toward Mars. Should they reach the planet, they would pass it at about 2,175 miles (3,500 kilometers) away just as InSight is landing. It will take only one of them to receive transmissions from InSight and relay them back to provide status information to Earth about the InSight lander’s descent and touchdown. The success of the InSight mission does not depend on MarCO’s performance (see “Listening for InSight” for more detail). 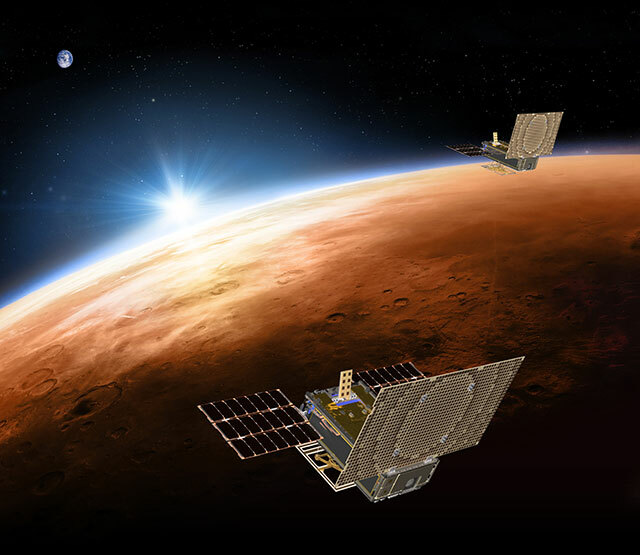 Should the MarCO CubeSats make it all the way to Mars, each has the capability to relay a substantive amount of data almost immediately, transmitting status information on a speed-of-light trip to Earth lasting 8 minutes and 7 seconds across about 90.7 million miles (146 million kilometers) between the two planets. The reason for flying two identical MarCO spacecraft is redundancy in case either one does not operate as planned. JPL engineer Joel Steinkraus works with one of the MarCO CubeSats during an outdoor test of its solar arrays. CubeSats are a class of spacecraft based on a standardized small size and modular use of off-the-shelf technologies. Many have been made by university students, and hundreds have been launched into Earth orbit using extra payload mass available on launches of larger spacecraft. But MarCO is the first attempt to send CubeSats to another planet. By verifying that the technologies for interplanetary missions are feasible and can be developed on a short timeline, this test mission could lead to many other SmallSat applications for exploring our solar system. Some could provide similar support functions as “carry your own” relay providers. Others could have primary scientific research functions of their own, such as radio transmissions through planetary atmospheres, imaging with small cameras, observations with other miniaturized instruments, or in-place measurements of space environments. The basic CubeSat unit is a box roughly 4 inches (10 centimeters) square. Larger CubeSats are multiples of that unit. MarCO’s design is a six-unit CubeSat. Each of the two spacecraft has a stowed size of about 14.4 inches (36.6 centimeters) by 9.5 inches (24.3 centimeters) by 4.6 inches (11.8 centimeters). During the flight to Mars, the MarCO twins each deployed a high-gain X-band antenna that is a flat “reflect array” panel engineered to direct radio waves the way a parabolic dish antenna does. This should allow MarCO to transmit data to Earth from as far away as Mars without needing much power. Two smaller X-band antennas on each spacecraft -- one low-gain and one medium-gain -- work without needing to be deployed. These allowed transmissions earlier in the flight and also receive radioed commands from Earth. The other deployed antenna is for the MarCO ultra-high frequency (UHF) radio receiver. InSight will be transmitting in UHF during its descent through the Martian atmosphere and from the surface of Mars. Both of the deployed antennas on each MarCO will be in fixed positions after deployment, with the high-gain antenna and UHF antenna facing different directions 90-degrees apart. The MarCOs have also tested new technology using a softball-sized radio, called Iris. This radio provides both UHF (receive-only) and X-band (receive-and-transmit) functions capable of immediately relaying information received over UHF, at 8 kilobits per second. A color wide-field engineering camera on each MarCO was used to confirm high-gain antenna deployment. The wide-field camera has a 138-degree diagonal field of view. MarCO-B also carries a color narrow-field camera with a 6.8-degree diagonal field of view pointed in the direction of the UHF antenna (the opposite direction from the high-gain antenna). (MarCO-A’s narrow-field camera was found to be inoperable prior to launch.) Both kinds of cameras can produce images 752 x 480 pixels in resolution. Each MarCO’s attitude-control system combines a star tracker, Sun sensors, gyroscopes and three-axis reaction wheels for monitoring and adjusting orientation. Accelerating a reaction wheel rotates the spacecraft in the opposite direction from the direction the wheel is spinning. MarCO’s propulsion system uses compressed R236FA gas, a common propellant in fire extinguishers. Each MarCO has eight thrusters that release this cold-gas propellant in different directions from a single, shared tank. The thrusters operate for trajectory adjustments and for desaturating the reaction wheels. 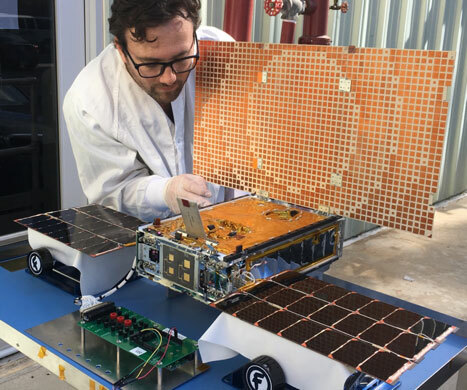 MarCO is pioneering CubeSat use of propellant for desaturating attitude-control reaction wheels; Earth-orbiting CubeSats typically control attitude with electromagnet devices that “push” against Earth’s magnetic field, an option not available to MarCO in deep space. Mission controllers have used the “cruise” period of flying from Earth to Mars not only to complete communication and navigation technology demonstration objectives, but also to check out each MarCO’s temperatures, power levels and other onboard subsystems. Each MarCO carries heaters, multiple temperature sensors, thermal blanketing and two radiators for thermal control. MarCO aim to relay data from InSight to Earth during InSight’s descent through Mars’ atmosphere and touchdown on the surface. NASA’s Mars Reconnaissance Orbiter will also receive these data from InSight. If all goes well, on Nov. 26, 2018, MarCO-A and MarCO-B will be flying past Mars during the critical minutes when InSight enters the Martian atmosphere, descends toward the surface and touches down. 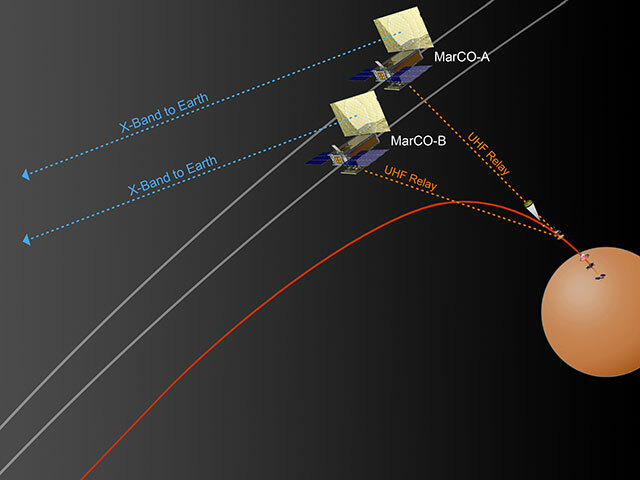 Each MarCO will maintain an orientation with the UHF antenna pointed down toward InSight as it lands on Mars, and the high-gain X-band antenna pointed back toward Earth. In this orientation, the solar panels will not be fully facing the Sun, so MarCO will be operating primarily on battery power. InSight will be transmitting its status information at 8 kilobits per second over UHF. Each MarCO will attempt to receive that data stream, format it and relay it Earthward in near-real-time to NASA’s Deep Space Network. Since MarCO adds formatting information, as well as a small amount of spacecraft information, to the datastream, the delay is expected to increase as more data are sent from InSight. The delay, however, is not expected to be more than a few minutes. Earth will be oriented so that the information relayed via MarCO will go to the Madrid, Spain, station of the Deep Space Network, from which it will be routed to the InSight mission operations team. NASA’s Jet Propulsion Laboratory in Pasadena, California, which manages both InSight and MarCO for NASA, built the two MarCO spacecraft in JPL’s CubeSat assembly clean room. At JPL, Joel Krajewski is MarCO’s project manager and Andrew Klesh is MarCO’s project engineer. Technology suppliers for MarCO include: Blue Canyon Technologies in Boulder, Colorado, for the attitude-control system; VACCO Industries in South El Monte, California, for the cold-gas thrusters; AstroDev in Ann Arbor, Michigan, for electronics; MMA Design LLC, also in Boulder, for solar arrays; and Tyvak Nano-Satellite Systems Inc., a Terran Orbital Company in San Luis Obispo, California, for the CubeSat dispenser system.